Could somebody post settings to install ReactOS 0.4.8 on VMWare 14 workstation/player with sound, 3D acceleration and network? starcrescent wrote: Could somebody post settings to install ReactOS 0.4.8 on VMWare 14 workstation/player with sound, 3D acceleration and network? This link is to a VirtualBox setup, I know it is not VMware, but it may just be of some help. Thanks for the link however I am not interested in VirtualBox. In VMWare can you change the virtualized hw? mrmajik45 wrote: In VMWare can you change the virtualized hw? 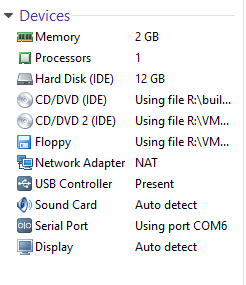 I do not know what exactly that means but there are several network adapter options, IDE, SATA, SCSI HD options and 2 soundcard options (AMD and real hardware). Well and that's why you got a link to a VBox setup. Use this as base for your VMWare VM. EmuandCo wrote: Well and that's why you got a link to a VBox setup. Use this as base for your VMWare VM. I am open to any suggestions/solutions for running ReactOS in VMWare/VBox with sound and 3D graphics. In tutorial it saya "does not matter"